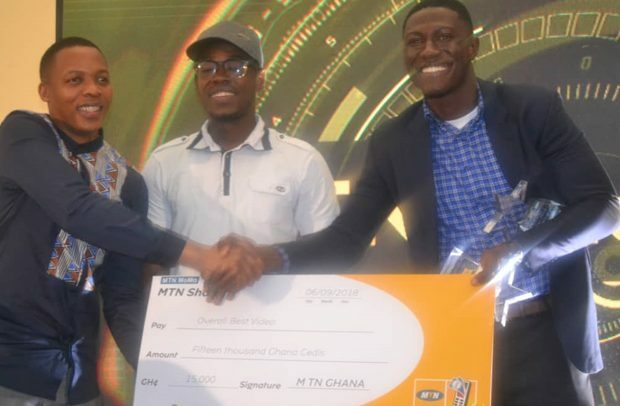 Jehoshaphat Kwame Agbee and his partners have emerged overall best winner of the ‘MTN Shortz Video Challenge’ for app developers with a video titled ‘Lost’. This was at the challenge’s finale on Friday. They received GH¢15,000 prize package in addition to GH¢6,000 for also winning best film category. The ‘Lost’ video tells the story of how a young man lost a lady he was dating to death at the dawn of his proposal to her. A video on ‘Mosquito Defence’ by Kwaku Tabiri won in the games category, while Lady M won the podcast category with ‘Don’t Be Shy’. DNA Multimedia also won funny the video category with ‘Auditions’. Two other contestants, Naomi Bediako and Buzz GH, were also awarded for most trending/funny video with the videos, ‘Respiration’ and ‘Auditions’. Barry Issah’s video on ‘Child Trafficking’ won in the animation category. They each received GH¢6,000, including other souvenirs from MTN Ghana. Speaking at the ceremony, Senior Manager at MTN, Bless Sefenu Agordjo, said the ‘Shortz Challenge’ is part of MTN Ghana’s effort to reward creativity while attaching monetary value to such creations. He indicated that MTN Ghana held two digital workshops in Accra and Kumasi for the developers, during which participants were taken through film production techniques. “MTN as a leading telco in the country will continue to lead the way by creating opportunities for the youth to monetise their production as a way of creating employment opportunities,” he indicated.